My wife and I have a lot of conversations about my clothes. I have to agree that I have far too many. If she really loved me she would make a quilt out of my t-shirts. That would really put a dent into the problem of my overflowing dresser and closet! Being a child of a hoarder, and thus eschewing hoarding in any way, I recognize the pathology in myself of placing sentimental meaning in things. For some reason, ratty old items of clothing are proving to be the most difficult items for me to purge as I push to move our family towards minimalism. They are ratty because they’ve gained my trust, sometimes for decades. It is as if they are a part of me. I donned the lovely ensemble you see here while engaged in a major painting project in my home. My goal is to get them so trashed that even I have to throw them away or cut ’em into rags. 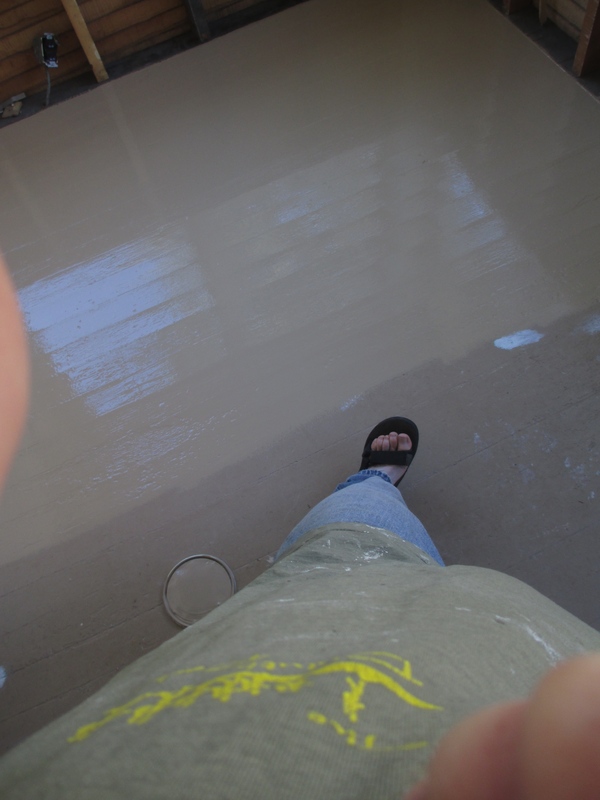 The Teva sandals made adequate painting shoes, so I could keep from getting debris onto my porch floor. Their soles are cracked from top to bottom. They are worn as smooth as a baby’s bottom, and I’ve possessed these gems since my 16th birthday. Thus they are 22 years old. The main memory they hold is a miserable one that involved me being late for school, again. The bell went off as I was entering an impossible slide from a full sprint in them while rounding the corner into the entryway of my class. I slid directly into the door, dropping a morning’s worth of books in an impressive splay across the floor. My head slammed into the tile for good measure. Everyone in geometry class laughed hysterically. I pretended everything was fine with my usual upbeat demeanor, but was dying inside. Finally I can part with them, making more room in our lives. Even I recognize that I’m cluttering the family home needlessly. The pants were a gift from my mom after I ruined a nice pair of jeans while attempting to clean out her home for the first time. They are 10 years old, and I remember the event like it was yesterday. My wife and I rented a hotel room since it’s impossible to stay there, and after three days of work we accomplished virtually nothing. This was quite an experience for Shawna. She experienced the effects of hoarding by painstakingly combing through layers, right down to the bottoms of piles that uncovered many surprises (dead mice, an unopened package of raw bacon that had been entombed there for years, and other oddities). I was proud of how she handled the situation with grace. Having her along made things more palatable. We became closer as a couple. Entire rolls of garbage bags were wholly inadequate to solve the problem. We needed a dumpster. For example, the front door couldn’t be opened more than a foot, and the familiar paths through the house were completely absorbed by the blob of objects that required us to climb through the home. Anyhow, it was lovely of my mom to buy me some new jeans so we could make the drive home with some semblance of cleanliness. One way my mom shows love is through the giving of things. Objects mean a great deal to her. The t-shirt I’ve had since I was newly out of the house at the tender age of 18, and is emblazoned with the logo for Wuda Wooch (the outdoor club I was a part of in college). Discovering northern Minnesota with an interesting and accepting group of guys and gals was incredible. With them I made my first trip into Canada, and explored many treasured places off the beaten path. Ultimately it was partly their influence that caused me to make the best decision I had ever made up to that point: taking nine months off of college (severing myself from the “real world” that was failing me) to seek a real education as a wandering man in the north woods of Minnesota and throughout the west on an expedition lasting a month via railroad. These memories and many more cling to the fibers of this t-shirt that has served me well for two full decades. In a very real way I didn’t actually start living prior to these last 20 years of my life. In reality these memories are a part of me. We don’t need objects to remember who we are and where we’ve been. Foolish Impracticality is the light at the end of the tunnel. Brian still has that T-shirt, too… but I’m all for him keeping it. It reminds him of Hans. A good wife you are! Wounds, Hans, lost potential, no words……. When we cleaned out my parent’s house, we filled a 32 yard dumpster…twice. We had no idea there was that much stuff squirrled away.